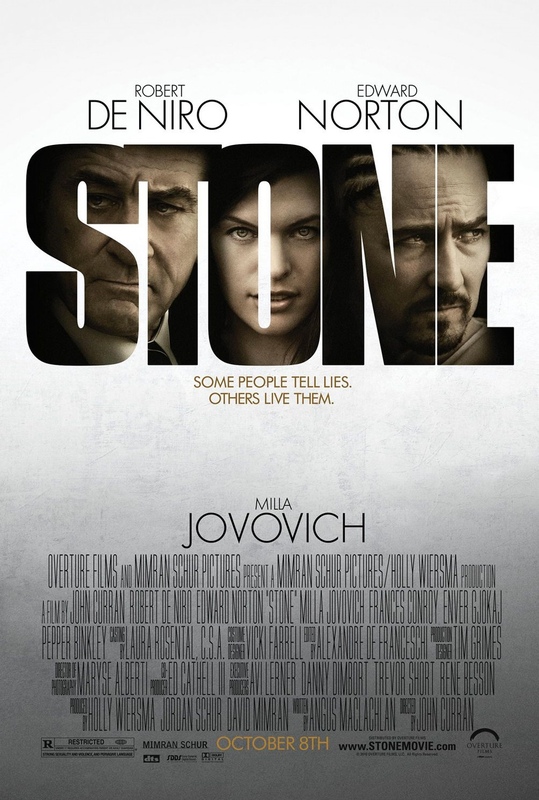 Starring: Robert DeNiro, Edward Norton, Milla Jovovich, Francis Conroy, Enver Gjokaj, Pepper Binkley. It’s a real shame that the great Robert DeNiro is starting to show his age, as their are very few roles out there that seem to suit him anymore. That’s not to say that he’s not good in this. He is, but I couldn’t help wondering what he could have done with Edward Norton’s role when he was in his prime. 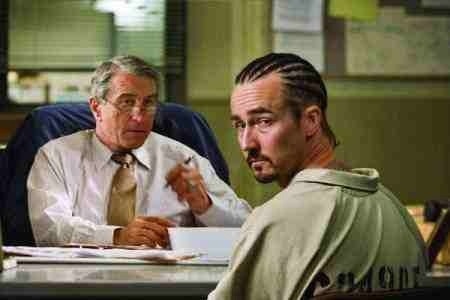 Jack Mabry (DeNiro) is a parole officer in a state prison who is handed the case of Gerald “Stone” Creeson (Edward Norton), a prisoner who has served 8years for arson and the death of his grandparents. With the decision now left with Mabry as to whether he is for suitable release, Creeson convinces his wife (Milla Jovovich), on the outside, to seduce and manipulate the parole officer and hopefully aide his freedom. It’s a pleasure to watch two of the finest actors of their generation put in great performances. However, the material they have at their disposal, sadly, isn’t up to standard. It starts very promising, shapes up to a fine menage-a-trois thriller midway, then suddenly goes flat and never really recovers. It tries, but once it decends into spirituality it loses itself. The two leads make the most of it and it’s excellent to see them sparring again after “The Score” – their first collaboration in 2001- which, for that matter, was also disappointing. It has it’s moments but ultimately it’s a wasted opportunity, with two masterful actors who are the only ones keeping this from sinking like a ‘stone’. This entry was posted on January 26, 2012 at 11:21 pm and is filed under Drama with tags 2010. You can follow any responses to this entry through the RSS 2.0 feed. You can leave a response, or trackback from your own site.